Last weekend my in-laws were down to help us continue to spruce up the house. My father-in-law is quite the handy man and has been so helpful with the home reno process. 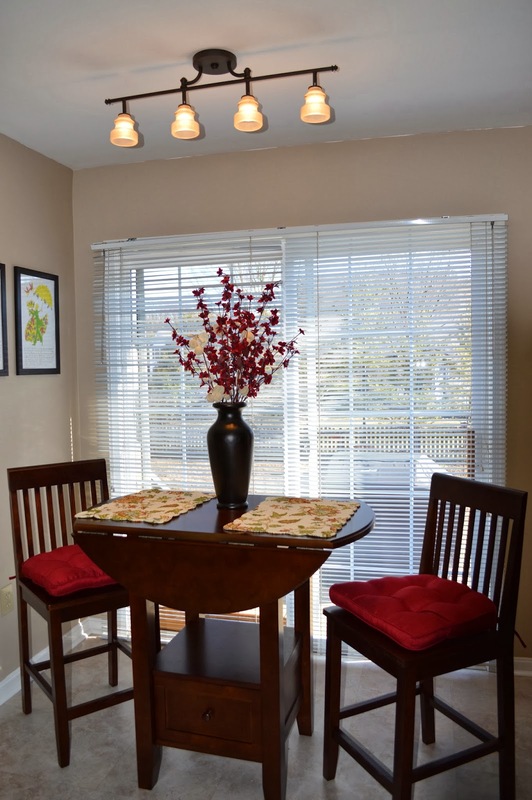 As my mother-in-law and I ventured around town to shop, he and Nick installed 4 new light fixtures (one of which included a dimmer), and started eyeing down prices to install a new sliding glass door (with blinds inside the glass) and crown moldings in our dining room. You know you're an adult/homeowner when light fixtures, sliding glass doors, and crown moldings make your heart skip a beat. I'm absolutely loving all of our updates and can't wait to continue to pull this home of ours together. Our dining nook in the kitchen is now just about complete. Table from Target, cushions & placemats from Bed, Bath, & Beyond. Floral arrangement is a few years old... probably a hodge podge of Walmart, Target, etc. Our new kitchen light fixture complete with dimmer switch (similar here) - and I am in love! It really brightens up & completes the room; you should've seen what was up there beforehand. Finally took some time to fill up our apothecary jars with something other than Christmas pinecones and/or air. Shower curtain, bathmats, & towels all from Target; other decor collected through the years. Your house is so pretty! Isn't it funny how things like that are so exciting?? We replaced an old fluorescent light in our kitchen and it made such a big difference! Love your little kitchen nook and also your bathroom :) Can't wait to see more! This is good progress on your home renovation. Thankfully, your father-in-law is quite a handy man to be able to install your light fixture. At least now you can focus on painting your office room. Yay! How is it, btw? “You know you're an adult/homeowner when light fixtures, sliding glass doors, and crown moldings make your heart skip a beat.” – So true! These are the additions in our house that will make our heart skip especially when you start to imagine the result. And the excitement will definitely double once everything is at its right place. Now that the kitchen and dining room has been done, what are your next plans for the house?